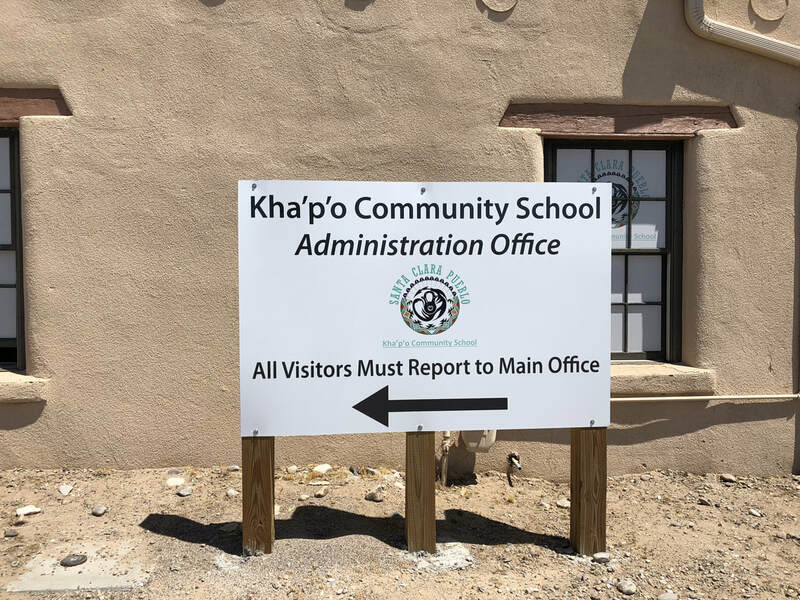 Kha'p'o Community School's bus services seek to provide all of our students with timely, safe, and dependable transportation to and from school. Any changes in bus services will be communicated via the Bright Arrow text messaging system. 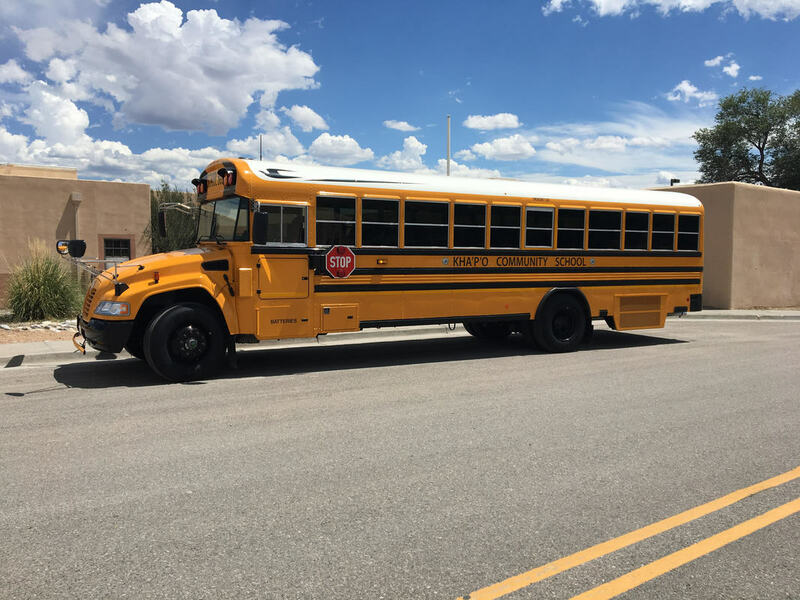 If you have questions regarding KCS Transportation, please contact Jeremy Simpson at 505-753-4406. ​KCS students will be assigned to ride on bus that operates daily according to schedule. The bus will pick students up only at the assigned place and time. The bus driver is not permitted to make unscheduled stops. If your child misses the bus, he/she may board at the next scheduled stop. Parents will be provided a bus schedule as well as the rules for appropriate bus behavior. It is the responsibility of the parents and students to know the bus stop time. The buses will unload students at the school drop-off area in the morning. Cooperation with the bus drivers is expected and appreciated. The policy of KCS is that the bus will stop only at designated stops. If a student misses the bus, it will be the parents responsibility to ensure they arrive to school on time. The KCS Student Code and Dress Code apply to all students who are riding the bus. All student code rules regarding major and minor offenses apply while riding the bus. The procedures for violating the Student Code will be followed. A major violation of the Student Code may result in the loss of bus privileges. All bus rules and regulations apply to students riding the bus for sports or activity trips. If a passenger’s behavior endangers the welfare of the driver and/or other students, the driver will call the School Administration and/or the police. The bus driver is the person in charge of the bus. Students are to follow all instructions from the bus driver. KCS has a number of students who do not utilize the bus transportation, but either walk or are brought to school using a personal vehicle. These students should enter through the front gates and go to the cafeteria for breakfast. Students riding bikes to school will have a parent permission slip on file in front office. Students will utilize the bike rack and should have their bikes secured with a lock. KCS will not be responsible for any stolen bicycles and/or will not be responsible for any damages incurred to the bike or its accessories. Bike riders will obey all traffic laws and regulations. Personal vehicles dropping off/picking up students will utilize the front parking lot and driveway. Please proceed with caution and wait your turn. School officials will be out in the pick-up zone to assist the students. In order to maximize student safety, your cooperation is appreciated. Students who walk to school will be required to use the front gates. The back gate will be closed at all times due to National School Safety regulations. Students will use all traffic laws and look both ways before crossing any major roads. All students must have a bus contract on file. The contract must be signed by the parents/guardians, student, principal and the transportation supervisor. Students within the interior boundaries of the Santa Clara Reservation are eligible for bus service. A bus schedule with pre-designated stops has been developed to provide students with consistent and safe transportation to and from school. If the bus driver determines that it is not safe for a child to be left at a bus stop (e.g. if it appears that there is no one home to receive the child or it there is an unknown or suspicious adult in the vicinity), the child will be kept on the bus, returned to school and either sent to the office or school resource officer until an appropriate person can pick up the child. Students are expected to display good conduct and follow school rules while riding the school bus. Students who fail to abide by the bus safety requirements may be suspended from bus service. Students should be at the bus stop in time to board the bus at the scheduled pick-up time. The bus will wait no longer than 2 minutes at each bus stop. No food or drink will be allowed on the bus at any time; this is to ensure the health and safety for all students and to keep the bus in good physical and operating condition. Students will sit in their assigned seats at all times. Students will not touch, hit, kick and or yell at other passengers NO Exceptions. Students will not yell or scream at any time on the bus or while it is moving. Students will only be allowed pick up and drop off at their approved locations, unless a parent has called the front office and made other arrangements. Students will not mark, cut and destroy bus seats or any other areas of bus at any time. Students will treat the bus as they would their school and class room while on the bus and respect the bus drivers at all times. If any of the above areas are found to be in violation then the student and description of the incident will be dealt with in a meeting with the School Principal, students’ parents and transportation staff. At the meeting it will be then determined the course of action for the student. Student will lose his or her bus privilege for three days. Upon returning to the bus a behavior agreement will be into place with students, parents and school administrations signatures. Student will lose their bus privilege for a set determined amount of time to be decided by the school administration. We want to provide a safe mode of transportation for all students and ensure they do not lose this privilege. Operating the school bus in a safe manner at all times is the overall goal. This requires the driver and staff to have special certification and skills. Any questionable behavior should be addressed immediately for the safety of everyone.